The older ruin is The Church of St Mary, Treyford dating back to the 13th century. 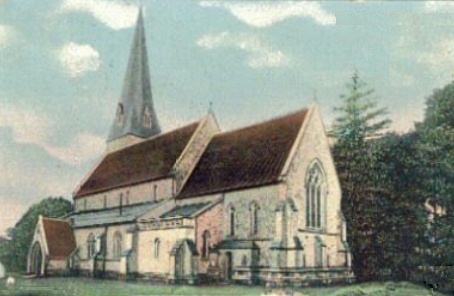 St Mary’s fell into disrepair and was replaced in the 1840s with a grand new church dedicated to St Peter. Known as ‘The Cathedral of The Downs’ St Peter’s was unfortunately built with poor quality local stone, and the church was demolished with explosives in 1947 after it became structurally unsafe. All that remains of St Peter’s today is the churchyard cemetery. The grounds are cared for by a local group who manage it as a wildlife site rather than a formal graveyard. Some parts have become overwhelmed with brambles, ivy and deep grasses – and many of the gravestones are now broken or have fallen down. Treyford Cemetery and the site of the demolished Cathedral of The Downs are on the northern edge of the village – marked ‘Cemy’ on the Ordnance Survey map. The site is managed by the Treyford Conservation Group to provide a natural habitat for plants, insects, birds and mammals.